The electronics we use today lives next to biology; the best we can hope for is a comfortable accessory satisfying minor curiosities. Real informational heft about our bodies is left to medical offices, specialized labs, and the occasional exotic piece of software masquerading as artificial intelligence. It doesn’t have to be this way. You should have access to the networks of biological information used by your body, instantly. Your immune system knows when you’re sick before your doctor does. Your stomach knows immediately when you’ve eaten something you shouldn’t have. Your lungs know when there’s too much pollution. We don’t need an endless array of gadgets strapped to our bodies. We simply need to be able to talk with the amazing biological systems that we carry around with us everywhere we go. At Cardea, we create the devices that enable this conversation, and this post here is the first time I’m really talking about what they are and what this means. This is a different way of looking at the world, and to understand it, it’s useful to look backwards a bit: About 20 years ago, nanotechnologists were creating our first functional devices. As Phil Collins’s first PhD student and Charlie Johnson’s postdoc, I was part of this. We had epic arguments over the future of the field. Were we really working on producing miniature robots and atomic scale factories? Or were we simply scaling down traditional electronics to keep Moore’s Law going? A third path forward was inspired by Nobel prize winner Richard Smalley in an infamous exchange of letters with Eric Drexler. The new understanding was that we already have miniature robots and atomic scale factories: the biology in and around us. Nanotechnology should be the way our normal hand-held technology interfaces with the complex, powerful world of molecular scale biology. These discussions lit a fire in my mind, and in the minds of many of us in nanotechnology at the time. We realized that the new carbon based electronics we were working on and discovering could work with biology instead of simply next to it. We could make devices that directly integrate with biological systems like nerves and the immune system at a level that was impossible for traditional materials like metals and silicon. We’ve all seen what this means in science fiction. Luke’s perfectly functioning artificial hand and Data’s emotional connection with an assimilated colony of skin tissue demonstrate our cultural instinct that there is a future where “technology” and “biology” are not separate fields. We’re clearly a long way from that, but we are taking the first steps. This is the kind of conversation that is long familiar at nanotechnology conferences. In the beginning, it was an exciting time. I gave talks on my first measurements of protein activity via carbon nanotube circuits to rooms overflowing with scientists. Well-funded startup companies sought out talent and universities scrambled to recruit promising young faculty. The scientific literature grew exponentially and is now packed with proof of concept studies on biocompatibility, “hero devices” producing incredible measurements, and amazing individual feats of nanofabrication. But, the fever broke. The world realized we had pushed the vision before we were ready to deliver. An uncomfortably large amount of money was spent in efforts that firmly entrenched access to this technology in elite physics and engineering labs. Rather than a focus on people and patients, we had produced incrementally improving scientific papers, a dramatic Nobel prize race to isolate graphene, no products, and many deeply disappointed investors. At nanotechnology conferences, the rooms emptied out. Universities stopped hiring. Startups closed. The vision of nanotechnology as a practical interface between biology and electronics was lost. It was too hard, people said. Biology was too complex. Nanoelectronics wasn’t reproducible. Nanomaterials didn’t fit into electronics fabs. Scientists and engineers in related fields moved forward without us. We have flash memory instead of carbon nanotube NRAM. We have foldable screens using OLEDs instead of graphene. The field became consumed with a never-ending treadmill of grants and publications with little real-world applicability. At the time, I was working inside the government, tasked with finding nanotechnology projects that would result in useful products. As a field, we still weren’t ready, and those projects didn’t yet exist. Rather than wait around for someone else to break the pattern of promising a technology and delivering a report, I decided to quit my job and attack the barriers that held back commercialization of integrated bioelectronics. Working with an incredible team of dedicated and hardworking people, we resolved to avoid the past mistakes of over-promising. This meant putting the product first in an environment where no one was sure we could make a product. We insisted on leadership and guidance from a business and commercial point of view. We nearly starved ourselves of resources, focusing only on those things that were critical to success. If biologists couldn’t use or understand the technology on their own, we went back and made it better and easier to use until they could. We spent years working on aspects of design, fabrication, and quality control that are not covered in scientific publications but are critical to creation of a product. While working, we watched several companies form and fold in this space. Over-promising was still a huge problem. Theranos didn’t help. We knew we needed to deliver a real technology before we could talk again about our vision. Those were hard years. The result is that today, we have resurrected the vision of nanotechnology as the interface between biology and digital electronics. We’ve done this by commercializing a graphene biosensor: scaled production on a commercial silicon fabrication line, reproducible measurements in our hands, and successful use by actual customers outside of the nanotechnology community. It’s time to meaningfully separate the worlds of nanoscience and nanotechnology, meaning we need to understand the difference between potential and practical use. To communicate this to the scientific community and our industry, we have a new publication out in Scientific Reports summarizing our work. This is groundbreaking and interdisciplinary technology, requiring an extraordinarily rigorous scientific review process by Nature Research, with three times more reviewers than typical to ensure every aspect of our technology was properly evaluated. We waited to publish until we had stable yields through our manufacturing process, internally and at our manufacturing partners Rogue Valley Microdevices and Samtec. Finding good partners was important, and we thank them for being true partners in this effort. It’s not enough to show one working device, or one wafer of working devices, or even one batch of multiple wafers of working devices. To really show a new type of electronics is ready, you need to show multiple batches working and demonstrate you understand what drives variations in yield. We have done that. We’ve also waited to publish until our core academic customers at Stanford, The Scripps Research Institute, and Keck Graduate Institute showed success on their own projects using our product. Having collaborators is great, but commercialization requires customers. This requires a product. Until you have sold something, you have an unproven technology. We made sure to find academic customers who would talk about their work, and then helped them see success and publication before we claimed success. Of course, we have non-academic customers as well, but it’s the academics who write the publications showing everyone what can be done. The technical details of what we’ve built are in our paper. 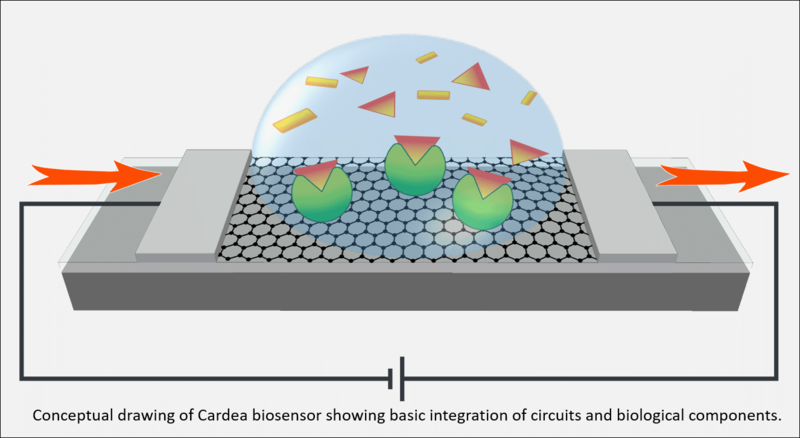 Briefly, what we have designed and built is a graphene enabled biosensor working on a principle called FEB: Field Effect Biosensing. 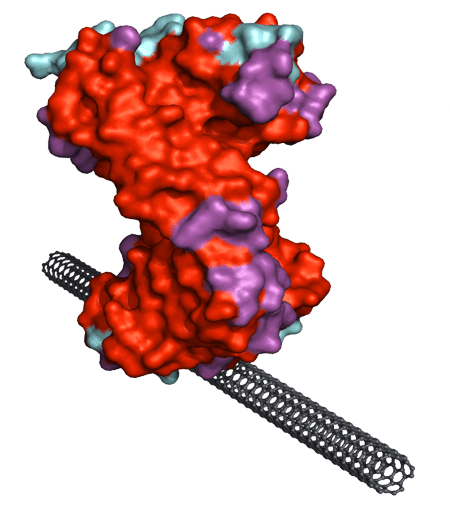 This directly incorporates biology into the function of a transistor, meaning we can watch the activity of any protein or piece of DNA in real time. Instant, digital information of the interactions of biological machinery with the environment allows us to form a gateway between the digital world and the biological world. This is done with conventional electronics: no spectrometers, no optics, no vacuum systems, no barriers to affordable, personal use. Our technology is the foundation for the first commercial product using a nanomaterial that is simply not possible to construct using conventional materials. I am again talking to packed rooms of scientists, but now only at biology focused conferences. Even so, we aren’t done moving this technology forward, in fact we have just started. 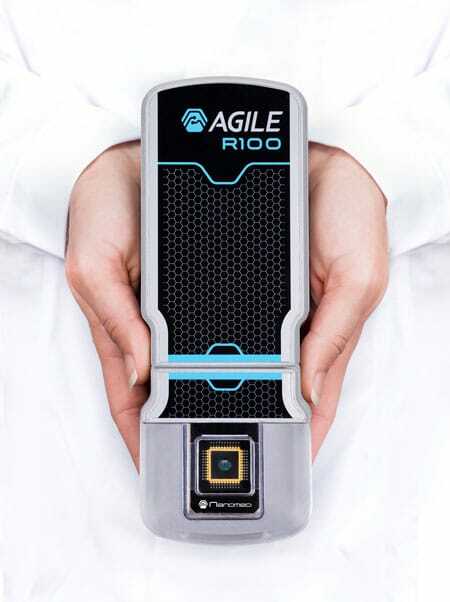 At least now we have a good first product for biomedical researchers and other people who want to talk with the biological systems in and around us. This is a necessary step on the way to providing something new to patients. The next steps for us are to accelerate movement in that direction. Right now, digital tools sift through vast databases of painstakingly curated medical data to find correlations. The pace and complexity of our information processing tools has vastly outstripped the ability of last century’s biological analysis technology. In this century, information processing and biological testing will be evenly matched in speed and complexity. You will have access to your own biological information in the same way you have access to Wikipedia, Google, and Facebook. The goal is a concept we refer to as the “Internet of Biology” or IoB. IoB is a useful short hand to describe the accumulated vision of two decades of work integrating biology and nanoelectronics. It’s a vision that is beyond the capability of one company. Biology is extremely complex, and the digital technology required to simplify this complexity for human consumption is difficult to construct and deliver. So we will need help. While we at Cardea have built a gateway between biology and electronics, we cannot understand and master all of this. The millions of potential applications of this technology mean that we need help bringing this all the way to the patients and regular people who need it. You should have access to the networks of biological information used by your body, instantly. Internally and with partners, we are working on diagnostics, biomarker detection, environmental monitoring, and personalized medicine applications. We provide a new infrastructure to access biology from the always on, always evolving world of digital electronics. We need to work with experts who understand both sides of our gateway. The most exciting part of this work is that if you are such an expert, today we can put new tools in your hands, and you can use this technology. If you’re ready, please join the revolution with us.